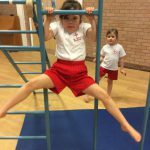 Welcome to our class page. 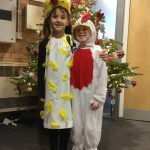 Here, you will find information about the children’s exciting learning, as well as any key dates or important pieces of information that you will need to know for the upcoming half term. 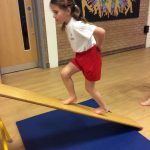 We have dance on a Wednesday and PE on a Friday so please ensure that kits are kept in school. 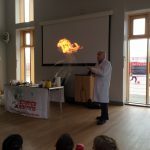 On Monday, we launched our Science Week with a exciting investigation. 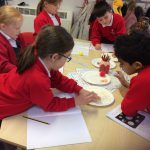 We looked at the craters on the moon and created our own craters in flour. 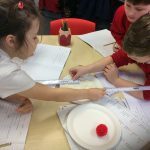 We tested a range of objects to see which one would make the largest crater. We made some fantastic predictions and gave wonderful reasons for our thoughts and ideas. 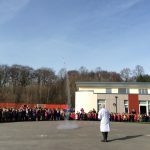 On Monday afternoon we had a super assembly, led by Donald from Science Boffins, followed by a rocket launch on the playground! 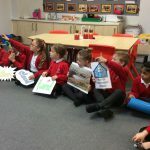 On Wednesday, Jayne from United Utilities came in to talk to us all about the importance of water, the water cycle and tips on how we can save water. 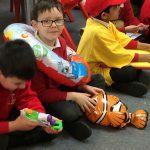 We were all thoroughly engaged and we all took part with great big smiles on our faces! 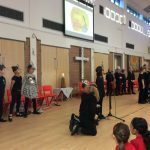 We learnt all about this Christian celebration which marks the last day before Lent. 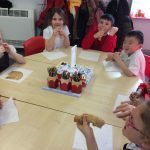 We talked about how people often give something up in Lent and people used to make pancakes, using rich foods such as flour and eggs before they began fasting. 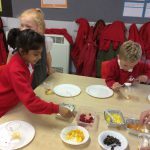 We all enjoyed sprinkling our pancakes with lemon and sugar before tasting them! 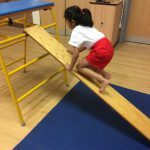 This half term in PE, we have been practicing our gymnastic skills. 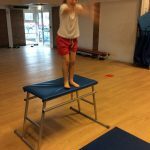 We have looked at rolls, jumps and balances. 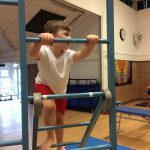 We got some of the equipment out and we had a go at transferring the skills that we had learnt on to the climbing frame and other equipment. 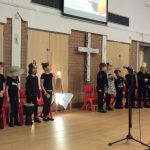 We are so, so proud of the children’s performances in our Class Worship. 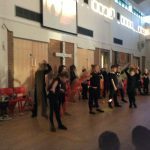 A huge well done to them all! 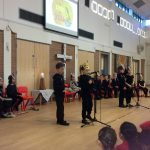 All of the children have thoroughly enjoyed putting their worship together and were very excited to share their learning with parents, grandparents and friends this morning. 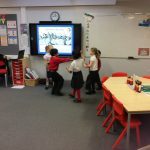 We took everybody on an ‘African Adventure’ with facts about animals, features in Africa and about African artwork. 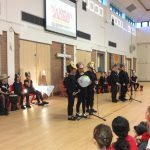 We sang African songs beautifully and even learnt some words in Swahili! 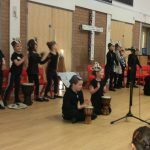 We played musical instruments wonderfully and finished our worship giving thanks to God for the wonderful world that He created and we performed a super dance. We hope you enjoyed it! 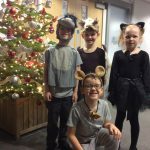 Thank you for coming to watch and for all of your support with learning their lines at home. The children should be very proud of themselves. 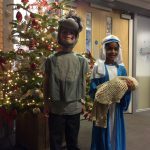 We are very proud of all of the children’s performances in the Christmas play, they were all fantastic. 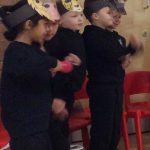 They worked very hard on learning their lines and their beautiful singing and dancing. 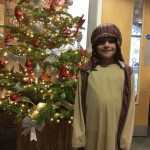 We thoroughly enjoyed retelling the story of Christmas and Jesus’ birth. We hope you enjoyed it as much as we did! 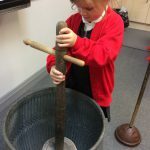 This half term, we have been looking at the Gunpowder Plot. 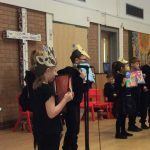 This week we discussed the story of the Gunpowder plot and some of the problems the plotters may have had. We worked in groups to role play some of these problems. 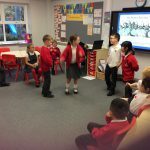 We then shared our role plays with the rest of our class. 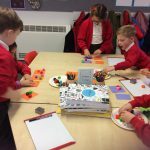 In Maths, we are learning how to multiply. 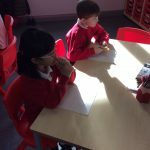 We know that multiply can also mean times, groups of, lots of and can also be solved by using repeated addition. 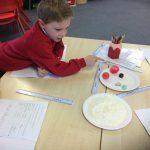 We have had lots of fun making equal groups of objects to help us solve multiplication problems. 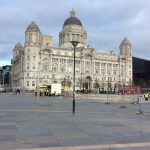 Last week we enjoyed a wonderful visit to Liverpool. This was a lovely start to our new project ‘Landmarks of Liverpool’. 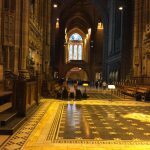 During the morning, we were warmly welcomed by the Anglican Cathedral where we had informative and exciting tours around the Cathedral. 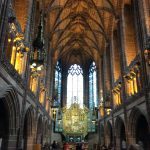 We saw lots of different chapels, we looked at the stained glass windows and the high altar. Most of us where surprised at how big it was and how beautiful it was. After lunch we got back on the bus and went to see the famous buildings down by the waterfront. 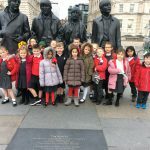 We loved looking at the Liver Building and the River Mersey. 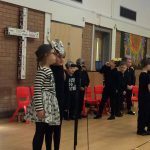 What a fantastic day we had! 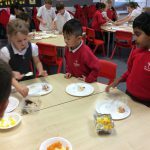 We have been learning about balanced diets and how we need a range of food from the different food groups. 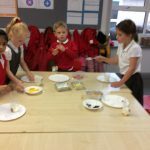 We have made ‘Energy Bars’ using oats and a little bit of sugar which are foods that give us energy. We talked about how it is ok to eat small amounts of sugar. 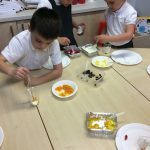 We also added some dried fruit because it is important to try and eat 5 portions of fruit or vegetables a day. 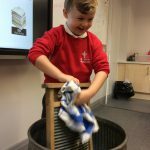 We used resources from Warrington Museum to learn all about how people used to wash their clothes in the past. 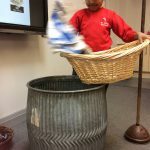 We had a fantastic afternoon guessing what all of the objects were for, before finding out what they were really used for. 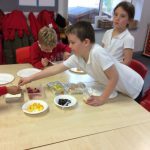 We have recently been looking at balanced and healthy diets. We know that it is important to eat lot of fruit and vegetables. 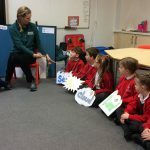 We were very lucky to have Cathy from Asda come in to our school and share some delicious fruit with us. 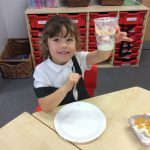 We tasted lots of different fruits and then using our favourites, we made a healthy yoghurt snack. 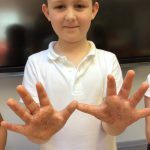 As part of our ‘Happy, Healthy Me!’ project, we investigated which was the best way to wash our hands. We covered our hands in oil and sprinkled glitter on them. 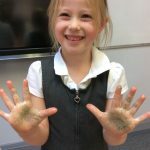 We pretended that the glitter was the germs! First we tried wiping our hands with a paper towel, but that didn’t work very well and there were still lots of germs on our hands. 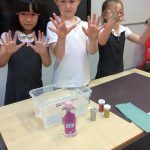 Next we tried washing our hands with cold water. This worked better than the paper towel but it didn’t get rid of all of the germs. Finally we tried hot water and soap which worked perfectly an got rid of almost all of the germs on our hands. This afternoon, we read The Colour Monster, which is a book all about associating colours with feelings. We talked about when we think of sadness, we often relate this to blue and when we think of happiness we often think of yellow. 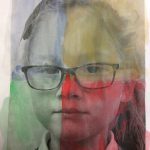 We had a go at producing some colourful artwork of our own in response to our discussion. 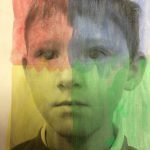 We painted our own self portraits in a range of different colours and discussed what feelings these colours may represent. 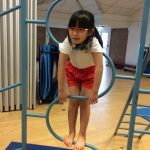 Welcome to Year 2! 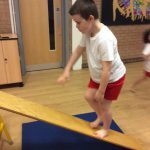 All of the children have had a wonderful first two weeks back, and they have all settled well into Year 2. 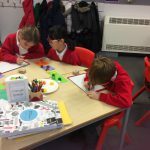 We have been looking at our Christian Values carefully, thinking of things that we can do, in order to show these Christian Values. 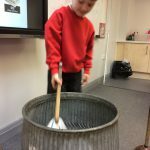 Some children said that they could show respect by keeping our classroom tidy and treating the equipment with respect. 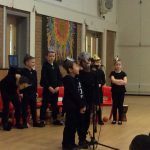 Other children talked about how we could show perseverance when things get a little bit tricky or show fellowship and compassion by being kind to others. 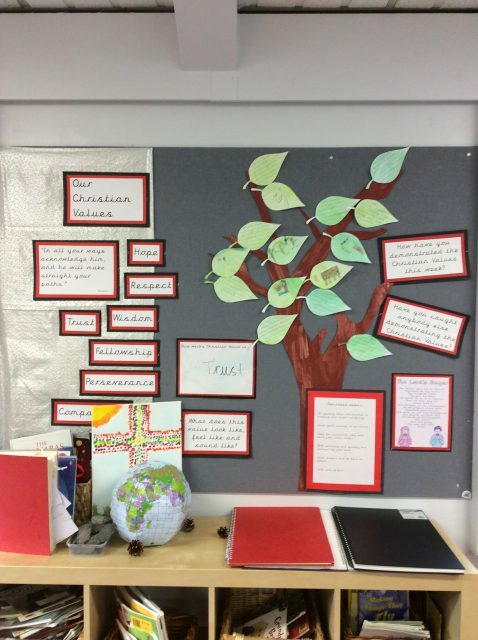 We wrote our ideas on leaves and created our own ‘Christian Value Tree’. We had such a lovely time at our picnic. In the morning we were very excited about making our own sandwiches. We made some really healthy choices. In the afternoon we took our teddies outside, and we were joined by families and friends. We enjoyed eating our sandwiches and treats. 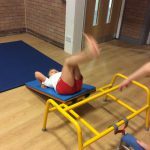 When we had finished, we had fun using the PE equipment. Thank you to everyone who joined us. We hope you enjoyed yourselves as much as we did. We really enjoyed our visit to the local library. 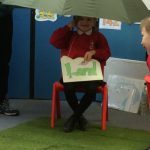 It was difficult to choose our favourite stories to share back at school. During our time at the library, we found out about the ‘Reading Challenge’ which begins very soon. We were really excited about bringing in our teddy bears. We wrote labels for them to give people more information. We included their name, their birthday, where we got them from and who gave them to us. Miss McKinnon’s class came in to look at our teddies, and we really enjoyed talking about them. We also looked at the teddies in Miss McKinnon’s class. 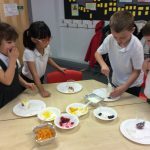 We enjoyed choosing our favourites, but it was very difficult. We were all really looking forward to our scooter session. 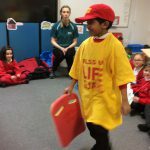 Our trainers helped us to understand the importance of being really safe when we are out and about on our scooters. 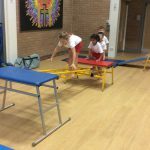 We had a wonderful afternoon, taking part in lots of races. Some of the races were tricky for us, but we persevered. 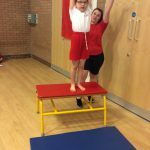 Our grown ups gave us lots of encouragement. 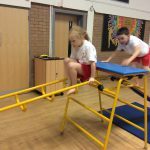 We enjoyed completing all the obstacles in our first race. 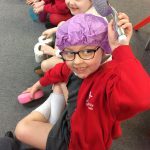 It was tricky trying to keep the quoit on our head. It was fun watching the grown ups skipping in the race at the end. 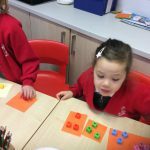 This week we have been exploring numbers to 100. 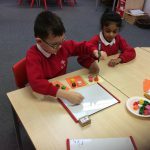 We began by using apparatus to make numbers in the ten times table. We used our counting skills to check we had made the numbers correctly. We then moved on to using tens and ones to make other two digit numbers. We had a wonderful day at Walton Gardens and Grappenhall Heys Walled Garden. During our time at Walton Gardens, we found many beautiful signs of nature. We enjoyed working with a partner, recording all the things we had found. One of the highlights of our day was seeing the baby goats in the zoo. We also enjoyed counting all the ducklings on the pond. At Grappenhall Heys Walled Garden Kate, our guide, helped us to plant our own seeds. We had to listen really carefully so we knew what to do. We were really excited about taking our pots home. We will need to look after them and water them once a week. It will be really exciting to see what grows. We really enjoyed our session. We consolidated our ball skills, and looked at how to control the ball with a racket. Some of us found this tricky. We were really proud of ourselves at the end. 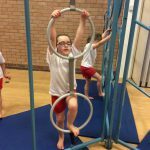 We have been developing our ball skills. 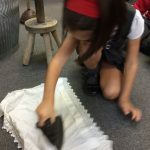 We worked with a partner, sending and receiving a ball. 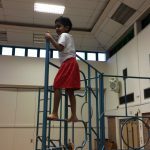 We thought carefully about where to bounce the ball so our partner could catch it. Some of us then used bats and balls with our partners. We really enjoyed our day with Caryl Hart. 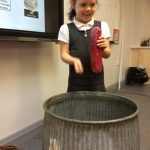 It was great to listen to her stories and find out about the different characters she has written about. One of the highlights of the day was using a story grid to help us make up our own traditional tales. 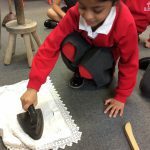 We worked with a partner to choose objects, places and characters. We enjoyed listening to each other’s stories. 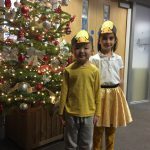 It was lovely to see the children dressed up in their costumes for World Book Day. 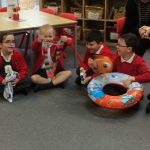 They were all really excited about sharing their favourite stories. A highlight of our day was visiting our new school library. We enjoyed sharing the story The Big Squirrel and the Little Rhinoceros by Mischa Damjan. This is one of our favourites. We had a fantastic day at Knowsley Safari Park. We really enjoyed the guided tour around the park and couldn’t believe how many animals we saw. The two highlights of the day were seeing the lions and the sea lion show at lunchtime. 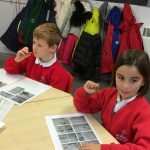 We have enjoyed looking at the photos taken during the day and talking about our favourite animals. 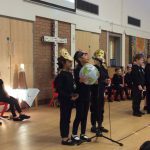 We thoroughly enjoyed sharing our work with our audience during our class assembly. 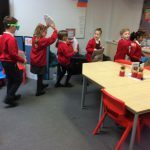 We really enjoyed learning the different actions for the songs we sang. 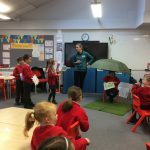 It was fun to work in small groups, learning rhymes from the book Rumble in the Jungle by Giles Andreae and David Wojtowycz. We really hope you enjoyed our assembly. It was lovely to see everyone smiling. We were very proud of ourselves at the end. Thank you for coming. 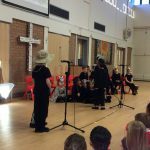 As part of our focus on God and Creation, we looked at the story The Tin Forest by Helen Ward and Wayne Anderson. The man in the story had an idea. He decided to create a forest. Although it wasn’t perfect, he was still happy with his creation. We talked about the Christian values the man in the story displayed. We decided that he showed perseverance, fairness and hope. Something wonderful happened because the man didn’t lose hope. During Health Week we talked about our favourite fruit and vegetables. 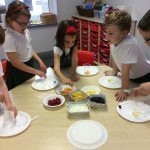 We were very excited about designing and making our own healthy snacks. 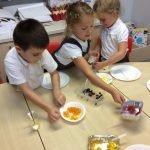 We used fruit and vegetables to make either a caterpillar, a lion or a peacock. 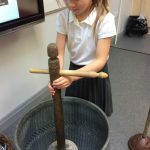 We had to think very carefully about how to use the equipment. 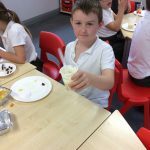 It was fun when we got to taste our creations at the end. We talked about what we like to use when we are creating things. Some of us like building things with blocks and Lego. 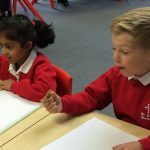 Others like to make things with pens, paper, scissors and glue. We also used peg boards to create colourful patterns. 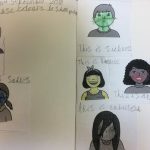 We talked about how we felt about our creations. 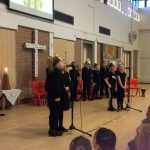 We have been talking about the wise men visiting Jesus. We looked at different pieces of art to see what we could find out about the wise men. We enjoyed talking about which piece of art was our favourite and why. 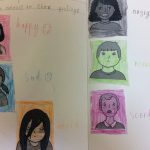 We then used oil pastels to create our own pictures. 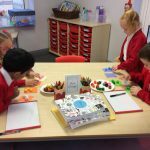 We thought carefully about which colours to use. 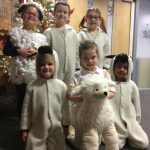 We all thoroughly enjoyed performing our Christmas play Prickly Hay. 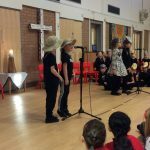 We worked so hard learning our lines, songs and dances. 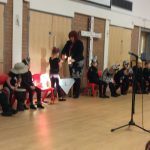 We were very proud of ourselves at the end of each performance. We hope you enjoyed it as much as we did. We looked at the story Lost and Found by Oliver Jeffers. In the story a little boy finds a penguin at his door. He is determined to return the penguin to his home. We enjoyed following the boy and the penguin on their adventure. 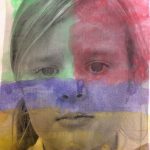 We used oil pastels to create our own pictures. 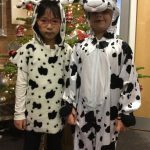 We were very excited to come to school dressed in spots or Pudsey Bear outfits. We enjoyed finding out all about Pudsey Bear. As part of our anti-bullying focus this week, we shared the story Rainbow Fish and the Big Blue Whale by Marcus Pfister. 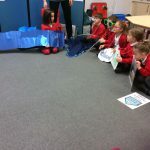 In the story, the fish are scared of the big blue whale and swim away from him. We predicted what might happen next in the story and had lots of ideas. We all agreed that we wanted the story to end happily. We have continued working on team building activities. We worked in small groups, looking for clues around the playground. When we had found our clues, we used them to spell words. It was fun working in a team. We had to listen carefully to each other. We shared the story Goldilocks and Just the One Bear by Leigh Hodgkinson. 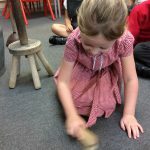 After talking about the story, we thought about how to make a strong chair for the bear. We chose from Lego, Duplo and Play-Doh. We worked in small groups to design and build our chairs. We talked about making the legs and seat strong to hold the bear. We were very excited about testing our chairs. 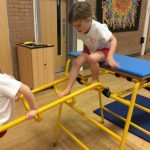 We discussed whether our chairs were strong enough and what we might do differently next time. We shared the story of The Gingerbread Man, stopping when the gingerbread man reached the river. We thought about what would happen if he fell into the water. We decided to find out by putting one gingerbread man in water and one in milk. 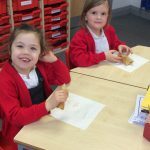 We thought that the gingerbread might go soggy or break. 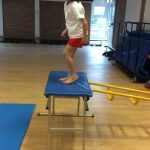 We tested this out and were very excited by the results. The gingerbread man in the water broke very quickly, and we were interested to notice that the water turned a different colour. We thought that this was because it turned the same colour as the gingerbread man. We visited the library for the first time as a Year One class. There were so many books to choose from. We were given the task of choosing one book between each pair to take back to the classroom. It was very difficult deciding which ones to take. We also found out how to become members of the library. Lots of us already belong to the library and enjoy choosing books for home. 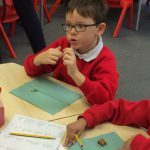 We were all really looking forward to working with Lego and had a wonderful afternoon. 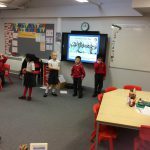 Stephen, our visitor, asked us all about this half term’s project ‘Down My Street’. We talked about all the different types of buildings we know. We were then able to use the Lego to create our own buildings. We had to concentrate really hard to make sure our buildings were strong. 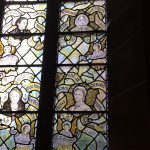 There were lots of different designs. It was a bit tricky adding the roof. When we had completed our buildings, each group put them together to make a town. My friend helps me when I fall over. I play with my friends every day. My friend makes me laugh. We play games together all the time. 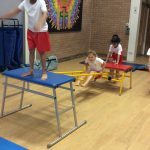 We have begun looking at teamwork and co-operation. We split into two teams and played a game. Each team stood in a circle and held hands. Then we had to pass a hoop around the circle. It was very tricky because we weren’t allowed to break the circle. 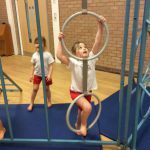 We had to think carefully about how to move our bodies to get the hoop all the way back to the start of the circle. 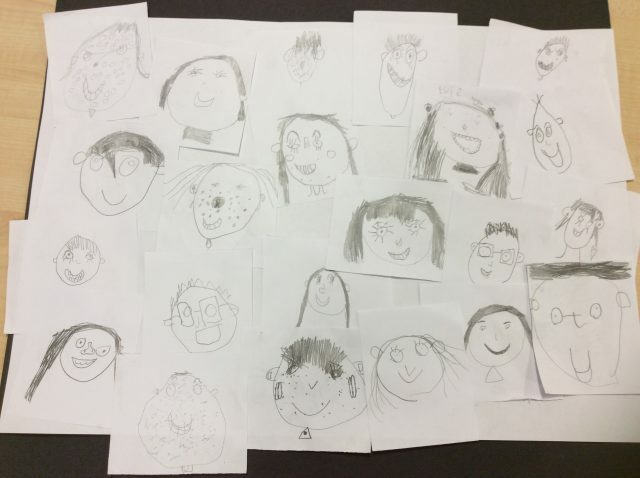 We began our new project ‘Down My Street’ by thinking about our own houses. We shared our ideas, thinking about similarities and differences between our houses. We then worked collaboratively in small groups. We used cardboard boxes, paper and pens to make a group house. We had to listen carefully to each other. 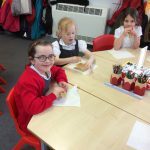 We all enjoyed looking at the different houses each group had made.